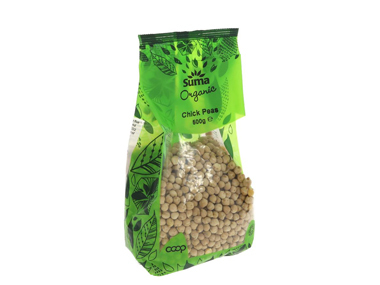 Buy Suma Organic Dried Chick Peas 500 grams in the UK from our online shop or directly from our independent Scottish store. Organic chick peas are great in curries, mash with onions and spices for savoury falafels. Falafel is made from chickpeas and spices. Traditionally served with houmous and pita bread. Add some lettuce, tomato or cucumber salads to make a nutritious meal. It usually is vegan and vegetarian and when using Orgran bread crumbs, also gluten free. This recipe contains OR 300g dried chickpeas. Hummus or houmous is made with chickpeas and tahini. It is a very healthy side dish which can be served with seasonal vegetables and bread of all sorts. This recipe contains 250 g dried chickpeas. Where can you buy real Chickpeas - Organic safely online? If you are wondering where you can buy Suma Organic Dried Chick Peas 500 grams safely online in the UK, then shop with us. Chickpeas - Organic - Suma Organic Dried Chick Peas 500 grams in Beans & Pulses and Foods.